The Elk family was grazing along the road by the creek. I stopped to snap some shots of the Bull meandering here and there. There were 3 to 4 month old calves playing in the brook. The afternoon sunlight was filtering through the trees. A perfect Fall Day. A huge calf, about 3 months in age, came walking closer & closer to an adult female, dropped to its knees and started feeding. OH MY GOSH! This baby was huge! but it still needed to suckle! Not to far away another baby walked to the edge of the creek to get a drink, while Dad, the Bull, laid down to watch the whole thing. Click, Click, Click goes the shutter. What a perfect family to paint. How unusual! 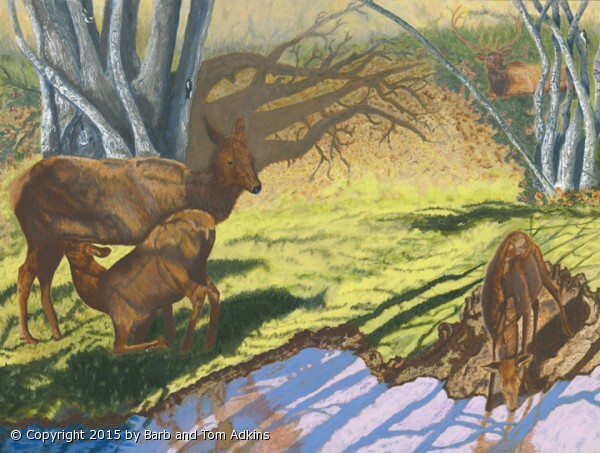 The Elk Family story, the afternoon lighting of bright sun,, the shadows of the trees and the pink cast on the water, including the reflections of the elk. What a wonderful and fun challenge. So much going on in one small setting. There are birds in the painting. This is one of my Mystery Series pieces. In this painting the focal point is the large center area in bright sunlight. Nothing is really happening there, it is just so pretty, very eye catching. Focus on the sunlight first. How often do we stop on a hike or drive and see a wonderful view. It is so enjoyable we stopp for a moment. But wait! what was that over there? A movement out of the corner of our eye. Oh, Look! A chipmunk, or bird, or fawn just moved that I did't see the first time. What is it doing? The elk calf is picking up a stick out of the water and actually throwing it around in play. How beautiful! Do Elk really play? In this painting I have used a Central Circular Composition focus with placement of the characters circling around the sunlight. Just as you might do after you have stopped and then discover what other delights are happening around the edges. Often more excitement is there then you ever expected, hidden in plain sight. The 7/8" edge of this painting is painted as a Gallery Edge, painted to match and compliment the picture. It may also be framed in a Silhouette Frame that will show off the Gallery Painted Edge. I like to paint the edges as part of the picture to give you a choice of how to hang it. When you are coming into a room or down a hall the effect is to give a color visual of something to see that is different or unexpected, rather than the regular edge of wood frame. Giclee on high end Torchon Archival paper or on Canvas. Please call for sizes and pricing.